The photos on this site are of plants found in our private collection, unless otherwise noted. ALL PHOTOS ARE COPYRIGHTED, so please ask for permission if you wish to use any: CONTACT. This site is updated periodically as plants bloom. Lilibiscus is a small section of the genus Hibiscus that contains about 10 species. These were the original species used in the development of the Hibiscus rosa-sinensis cultivars that exist today. Hibiscus rosa-sinensis cultivars are the result of crosses (both ancient and modern) between a limited number of species ―the majority from the Mascarene islands in the Indian Ocean and the Hawaiian Islands in the Pacific. This complex hybrid group was derived from a number of species that included most if not all of the following: Hibiscus arnottianus, Hibiscus boryanus, Hibiscus denisonii, Hibiscus fragilis, Hibiscus genevii, Hibiscus kokio, Hibiscus liliiflorus, Hibiscus schizopetalus, and Hibiscus storckii. Sadly, nearly all of these (as well as numerous other Malvaceae species) are now considered extinct or facing extinction in their natural habitats. 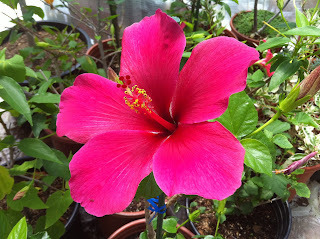 For additional information on other related species, go to the Hibiscus & Malvaceae Page. Hibiscus rosa-sinensis is grown all over the tropics and sub-tropics but by far the greatest diversity of cultivars can be found in India, China, Southeast Asia as well as the South Indian Ocean islands. It is widely believed that these are the areas where the primitive forms of the species were first cultivated. It is also possible that some of these areas may still harbor the original primitive forms. For example, in 1941, Skovsted theorized that Hibiscus storckii, once found on the island of Fiji, is actually a primitive form of Hibiscus rosa-sinensis. (A. Skovsted, a Danish cytologist, made a chromosome count of the species which is reported in "Chromosome Atlas of Flowering Plants"). Given its genetic history, it is not surprising that Hibiscus rosa-sinensis exhibits a wide array of traits and a dazzling variety of forms and flower colors. Hibiscus rosa-sinensis is a woody shrub normally between 1m and 6m in height (depending on the variety) and can be densely or sparsely branched. The branches can be short or long, stiff and upright, or flexible and pendulous. Leaves can be broad or narrow, variegated or plain, with deeply cut or completely smooth margins. There is a wide range of flower variation as well, in a broad assortment of colors and forms. Flowers can be grouped or borne singly, in shades of white, lavender, pink, red, orange and yellow or any combination thereof. Flower types may be single or double and large or petite in size. The staminal column is parted in some double flowered varieties or it may be modified into petals in others. Surprisingly, most Hibiscus rosa-sinensis varieties are able to tolerate some moderate drought conditions. While most varieties flower profusely with irrigation, during periods of drought they will often revert to mostly vegetative state ―with a decrease in growth and a decrease in the size of both leaves and flowers. The photos below are of plants found in our private collection. Photos are copyrighted, so please ask for permission if you wish to use any . This site is updated periodically as new species bloom. 'Black Beauty' does not quite live up to its name. Although extremely beautiful, the color is more of a deep burgundy-rose color. The flowers are large and attention getting, for this reason alone it is definitely worth growing. But to say the flowers are purple to black is a stretch. “Flowers have spoken to me more than I can tell in written words. They are the hieroglyphics of angels, loved by all men for the beauty of the character, though few can decypher even fragments of their meaning."